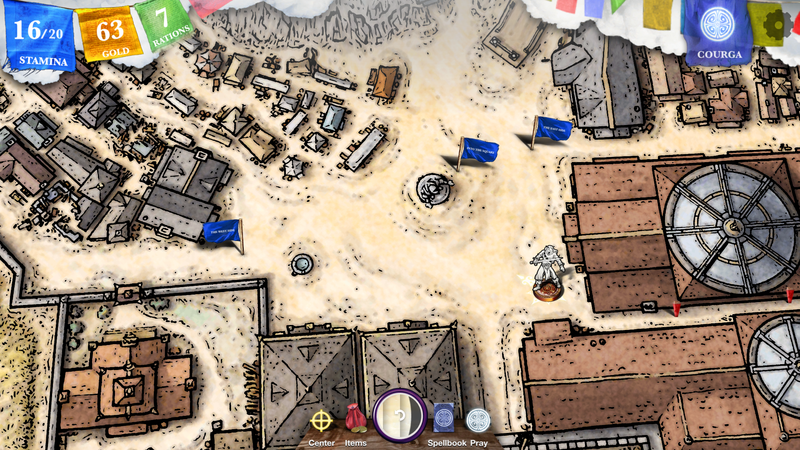 With the release of Sorcery's fourth episode, this thrilling adventure comes to a close. 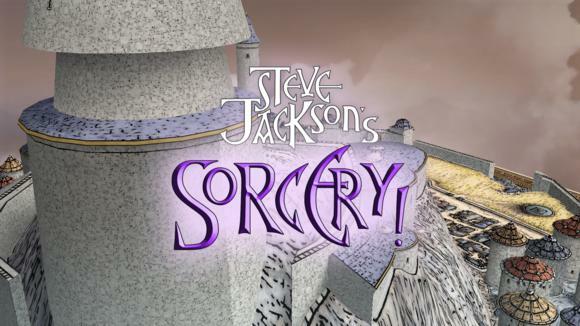 When last I visited Steve Jackson’s Sorcery, only the first two episodes ($10 on Steam) had made their way to the PC. We’d crossed the low foothills of Analand and survived the back-alleys and ne’er-do-wells of Khare, Cityport of Traps, but we were little more than halfway to the city of Mampang and its evil Archmage. Six-ish months later, it’s time for Sorcery! to come to an end with the release of Episode Four simultaneously across all platforms, and thus time for us to revisit the series. Did it hold up? It’s odd to think that 2016’s most epic—in the traditional sense of the word—game might end up being conveyed completely through text, and yet here we are. Sorcery is a sprawling adventure, a Choose-Your-Own-Adventure of almost mind-boggling scale, spread out across four installments roughly matching the original four adventure gamebooks from the 1980s. You, a lowly adventurer, must make your way from your small village to the fortress of the Archmage and steal back the Crown of Kings. 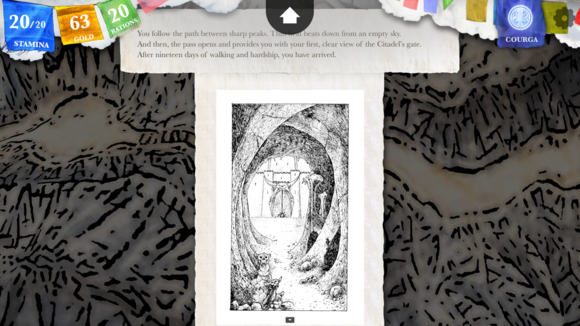 Sorcery is part text adventure, part RPG, played out on hand-drawn 2D (and sometimes 2.5D) maps. 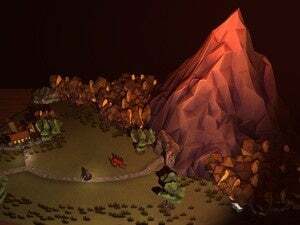 Your journey is a series of nodes, wherein each node represents an event—be it a random encounter with some hostile centaurs, a chance meeting with a flirtatious goblin, or a plague-stricken village. It amounts to hundreds or maybe even thousands of choices, from the mundane (“Should I go into this abandoned hut?”) to the perilous (“Do I try to hit this manticore with my sword or throw a fireball at it?”), adding up to a unique journey each time. Or semi-unique, at least. And it only gets more convoluted with each episode, as developer Inkle (of 80 Days fame) throws various twists at you. 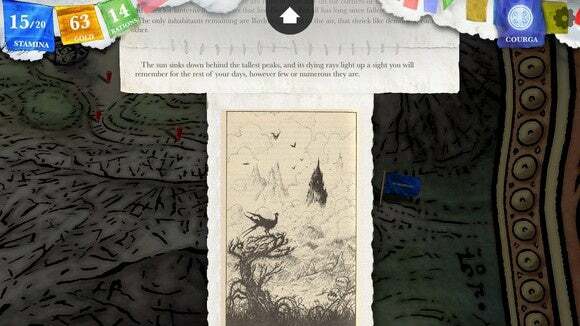 Where Episode One is a fairly straightforward and mostly-linear adventure, Episode Two widens and throws more paths at you—and penalties for not adequately exploring. Episode Three broadens out into a pseudo-open world, where your only limits are how much food you’ve brought along and your own patience. Well, I hope you didn’t come to rely on Rewind as a crutch, because Episode Four takes it away from you—justified by the story, though I won’t spoil the canonical reason. There, in the shadows of Mampang, everything takes on new urgency when a single misstep could mean death, a single conversation derail your quest. 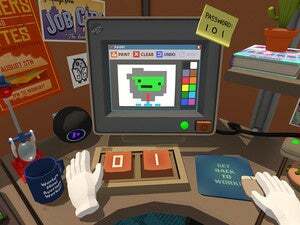 And yet despite the sense of impending doom, Episode Four ($10 on Steam) is quite a bit friendlier than its predecessor. I admit I wasn’t a huge fan of Episode Three ($10 on Steam), which we never covered in a standalone review, but I played in the run-up to Four. It has an amazing concept, with a past world layered atop the present, and the player left to unravel what happened in between the two eras. But as I mentioned, the third episode played out in a pseudo-open world format. You’re tasked with killing the Archmage’s servants, the Seven Serpents. Each is semi-hidden, and discovering all seven is a bit of a chore. Moreover, the third episode is at times incredibly unfair. It’s fond of stealing your hard-earned items away, ruining your rations, and taking or otherwise rendering useless your weapons, all whilst you wander around the map aimlessly. The fourth episode is a return to the more linear stylings of the earlier episodes—lots of paths, but with a clear goal in mind. Going forward mostly closes off the areas you’ve left behind, and the game is better for it. Yes, even without Rewind. Looking back on it all, my one disappointment is that the episodes didn’t tie into each other more, though I suspect this is in part due to the source material. A few key choices do re-surface later in the story, but many are relegated to flavor text if they appear at all. I expected more of my early-game decisions to play a role throughout, aside from what items I gathered and what clues I’d uncovered about the world. But alas, I assume the original books wanted to allow anyone to play any part of the journey without being put at a disadvantage, and so it’s rare for Sorcery to call back to an earlier inflection point. Sorcery‘s combat is also its weakest component. I feel pretty confident saying that after four episodes and however many hours I’ve spent on my journey. (I’d estimate around twelve, though it’s hard to tell because I’ve played some episodes multiple times.) The turn-based combat becomes too easy too early, and lacks any of the complexity found in the game’s other systems. It’s especially noticeable because the other half of Sorcery’s monster encounters is your spell-book, a sprawling tome of 40-something scraps of magic—everything from invisibility (requires a Pearl Ring) to levitation (requires a Jeweled Medallion). Eventually you realize that if you can avoid combat, be it by spell or by smooth-talking, you should take the chance. Not only is your effort normally rewarded, but it’s a damned sight more fun than yet another boring hack-and-slash fight. Sorcery is something special though. I went back and replayed the first two episodes prior to jumping into the latter half, and was amazed how many encounters I’d missed, how many important items I’d blithely walked past. There are so many nooks and crannies to pop your head into—and hope that said nook or cranny isn’t occupied by an invisible Snattacat or a ten-foot-tall Skunk Bear. It has its weak moments—especially in the convoluted third episode—but it’s worth struggling through in order to get to the end of this very, very long adventure. The Crown of Kings awaits. 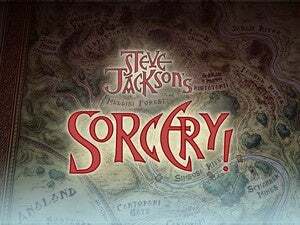 The PC adaptation of Steve Jackson's Sorcery! 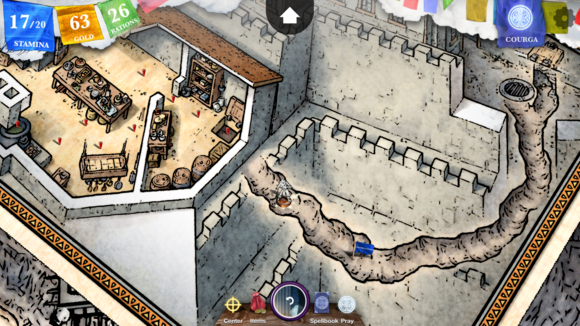 gamebooks has some rough edges, but it's a thrilling, sprawling adventure overall.